Oxymetholone is the strongest and, at the same time, also the most effective oral steroid. The compound has an extremely high androgenic effect, which goes hand in hand with an extremely intense anabolic component. For this reason, dramatic gains in strength and muscle mass can be achieved in a very short time. An increase in body weight of 10 - 15 pounds or more in only 14 days is not unusual. A short cycle of Oxymetholone could account for a gain of over 20lbs in many users, sometimes more. As this drugs anabolic properties are so extreme, so are it's androgenic side effects. 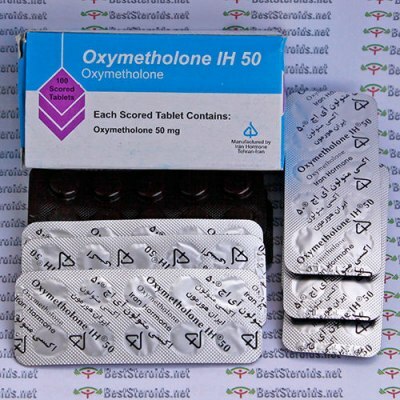 Due to the strength of these side effects, Oxymetholone should never be used by women. When taking Oxymetholone the athlete experiences an enormous "pump effect" during the workout in the exercised muscles. The blood volume in the body is significantly elevated causing a higher blood supply to the muscles during workout. The highly androgenic effect of Oxymetholone stimulates the regeneration of the body so that the often feared "overtraining" is unlikely. Because of it's extreme androgenic and anabolic effects, it should never be used by women. Anti-estrogens, such as Nolvadex, should be used with this drug to counteract the aromatization. A-bombs! Got a lot of strength gains on this stuff and I stacked it with a blend of Boldenone and Test Enanthate. The water retention was not as bad as I thought it will be but I must admit that while on it I felt agitated and un-easy. Helped a lot in the overall strength department. I bought Irani Oxy before from Alhavi but IH is much stronger.